As days go, apart from those on the mountains themselves, this day will stand out in my memories for an awful long time. 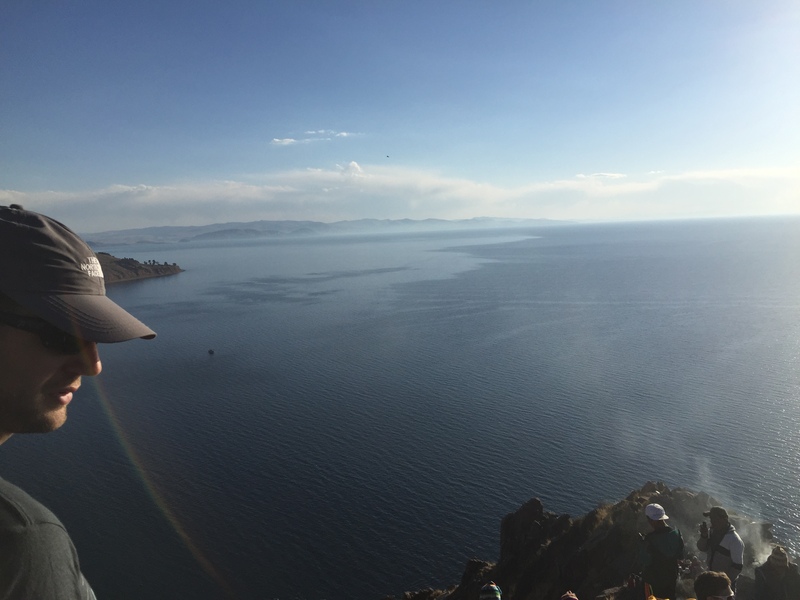 To be on a boat trip in perfect weather, and lunching on The Island of the Sun in the middle of Lake Titicaca, is surely something that few people will ever do. And here we were having it thrown in as part of our acclimatisation routine. 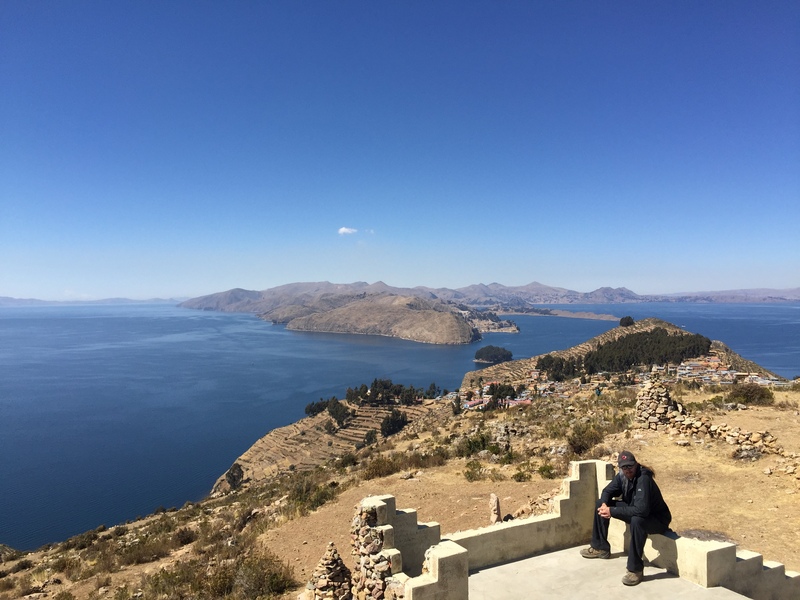 When I had first read the trip dossier and had seen the listing for Titicaca, I had been if not exactly non-plussed, then certainly not over-excited. I can only say now, having had the privilege to go, is that it is a totally stunning and magical place, with some views that will absolutely take your breath away. 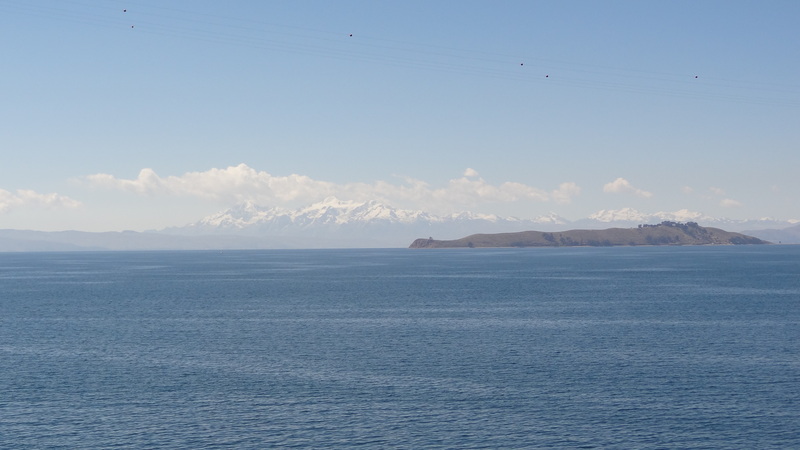 I will put a picture here below of my lunch spot, taken from the Island of the Sun, looking over the Island of the Moon, with the Cordillera Real spoke of the Andes mountains framed by the sun over Lake Titicaca herself. The phrase “died and gone to heaven”, whilst an overused cliché, is here simply a gross understatement. Looking out to Illiampu, at 6,430m in the Cordillera Real, the Island of the Moon in the foreground, taken from our lunch spot on the Island of the Sun. A forever memory for me. We set out at 8am and walked through into Copacabana past the still partying Peruvians. I wasn’t sure if they had started early, or were still going from the night before. Certainly the fireworks has been going long into the night, and made what would have otherwise been an idyllic and tranquil stay at the EcoLodge an interrupted night. 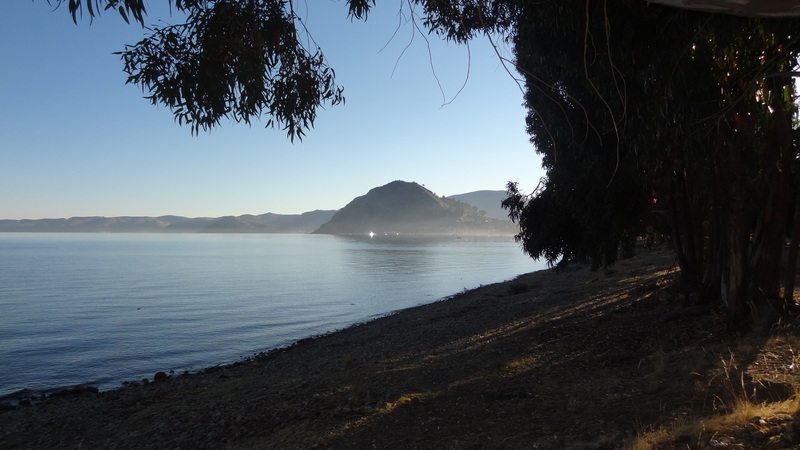 The view of the lake walking out of our lodge…..
…..and the view along the shore looking towards Calvary Hill where we had walked up last evening. 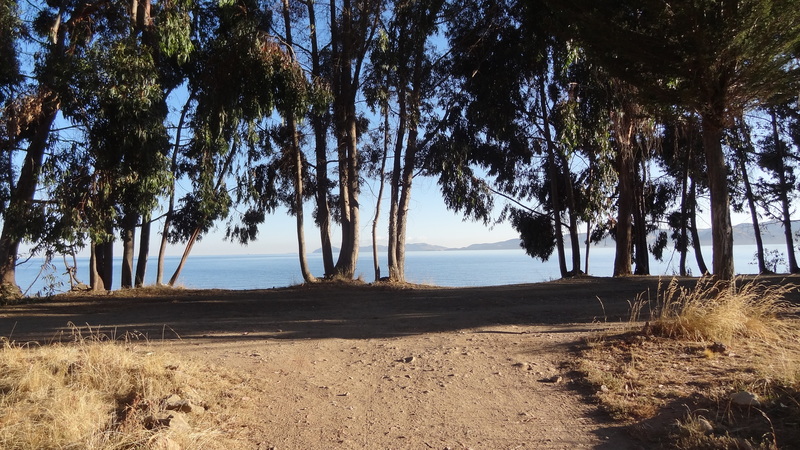 ….and docking on a tiny jetty at Isla del Sol. A boat awaited us and took us across a ridiculously tranquil part of the lake, past the hill we had climbed the night before, and towards the island which awaited us. 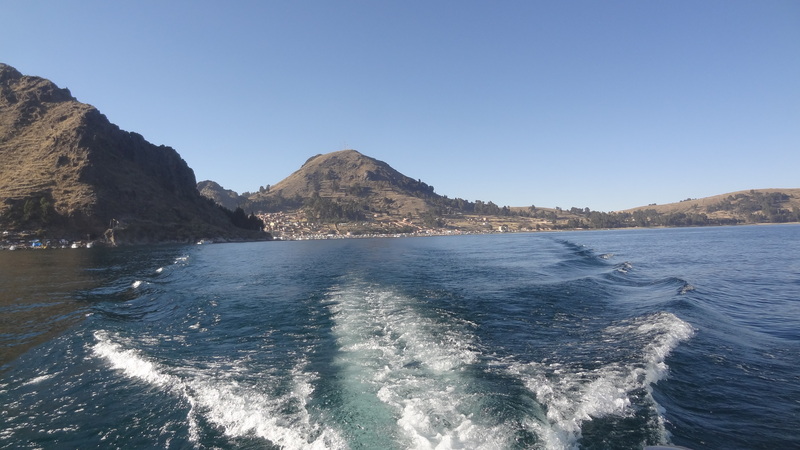 Some 10 sq km in area, the Island of the Sun is the largest island on Titicaca, and takes an hour to reach by motor boat. 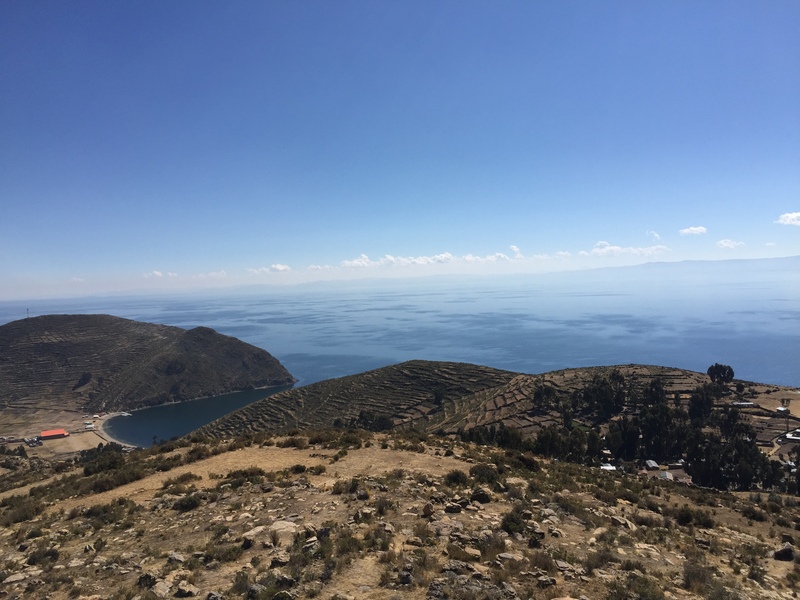 We reached the island by small inlet and a tiny jetty, the only boat around, and were taken up some steep steps to a ruined 11th Century fort come temple, which looked over to the Peaks of the Andes in the distance, and Illiampu (6,430m) in particular. 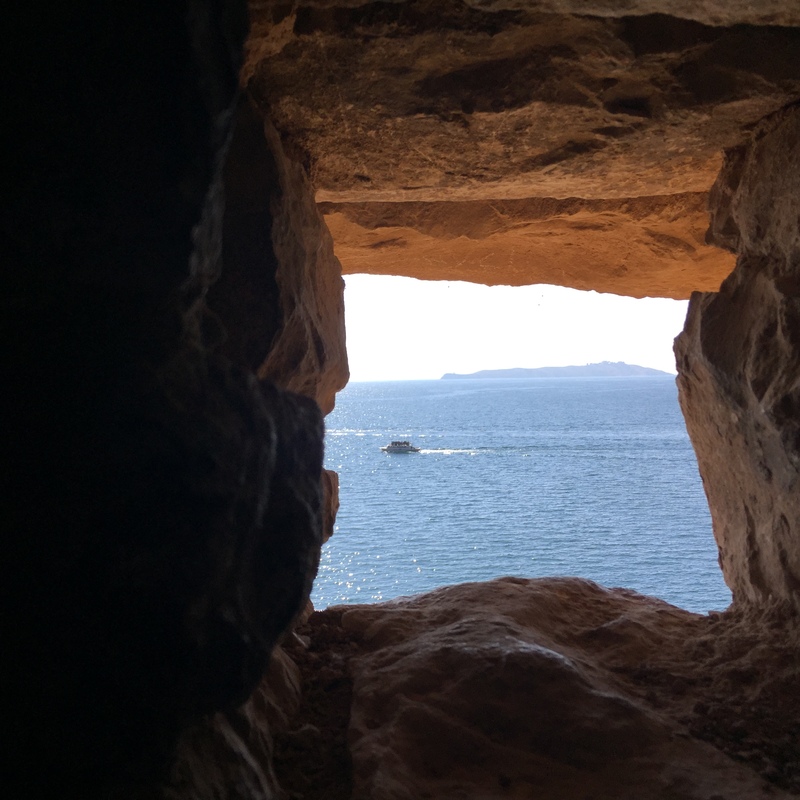 A view out from the stone fort. 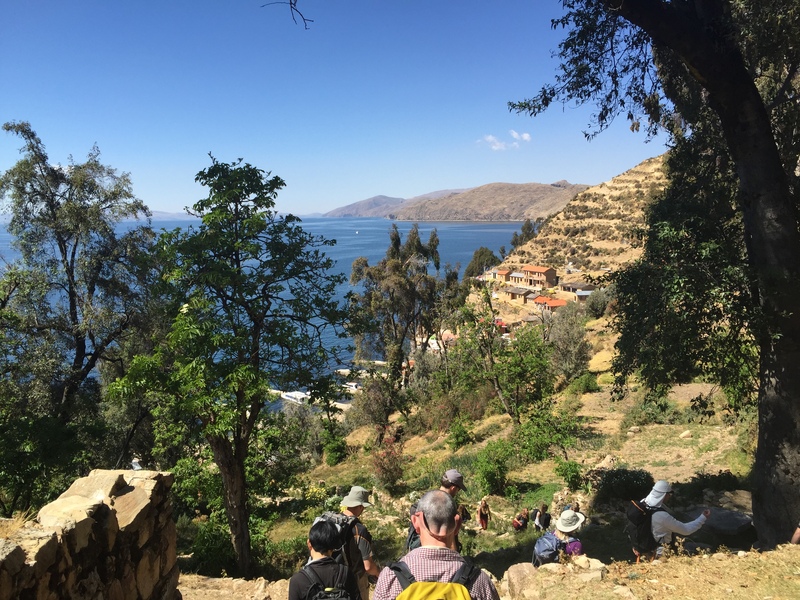 After a brief look at the temple, and some really great explanations on the local flora and fauna by César our guide, we began our trek up to the high point of the island, at 4,100m, so some 450m ascent for us. We discovered afterwards that technically there is another part of the island which is 4m higher, but that is a by the by. 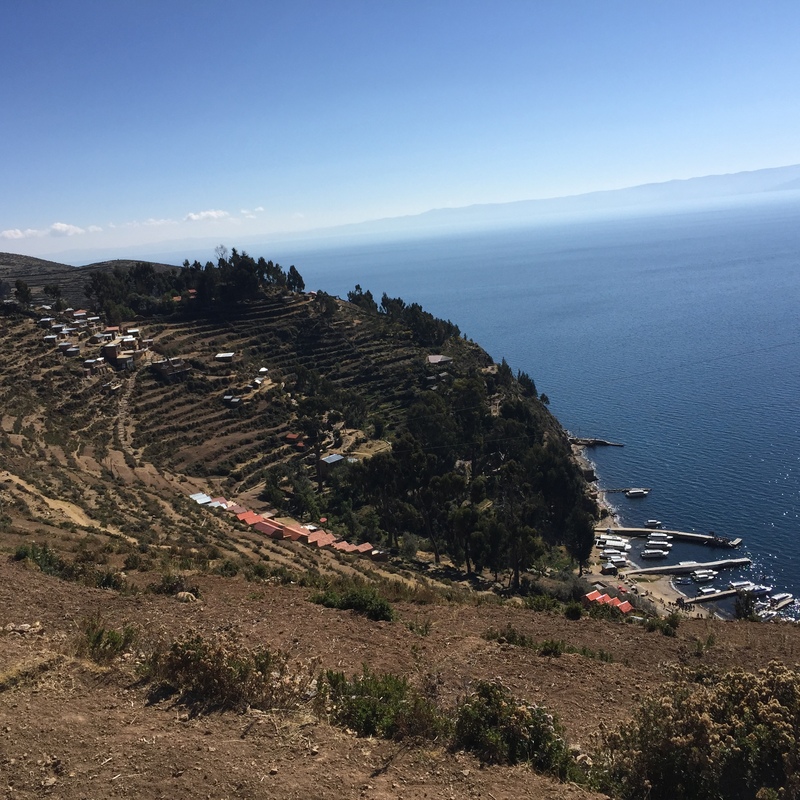 The terraced landscape shows the island’s reliance on agriculture for its produce, some of which we would sample later at lunch. A typical island building, and its only form of transport in the front garden. ….and South towards Illiampu and the rest of the Cordillers Real, the Island of the Moon in the foreground. I could have stood here forever. 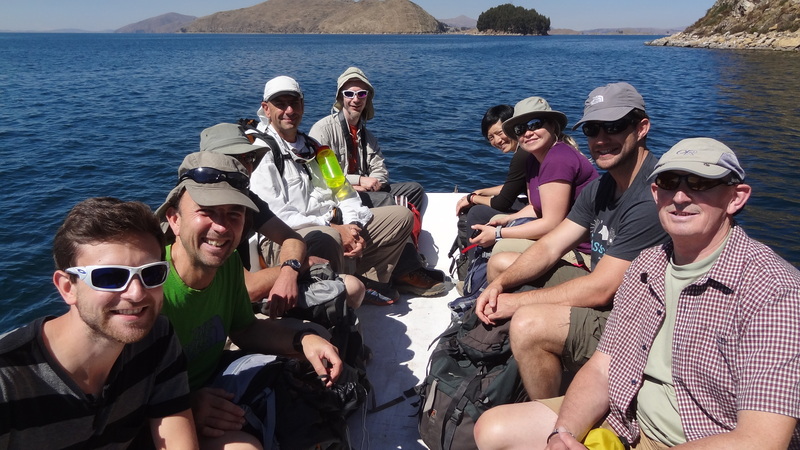 And here is our whole group – from left to right, Lesley, Alessandro, Jim, John 1, Laura, Yours Truly, Gavin, Lotte, Patrick, and John 2. 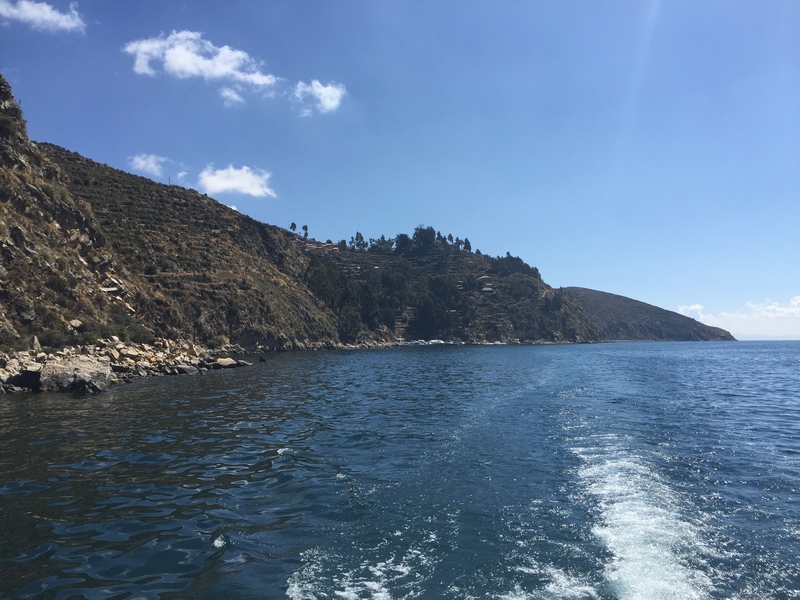 We then began our descent towards the main port of the island and to a most majestic and beautiful inlet, with such pretty flowers and walkways that it could have been from a fairytale. 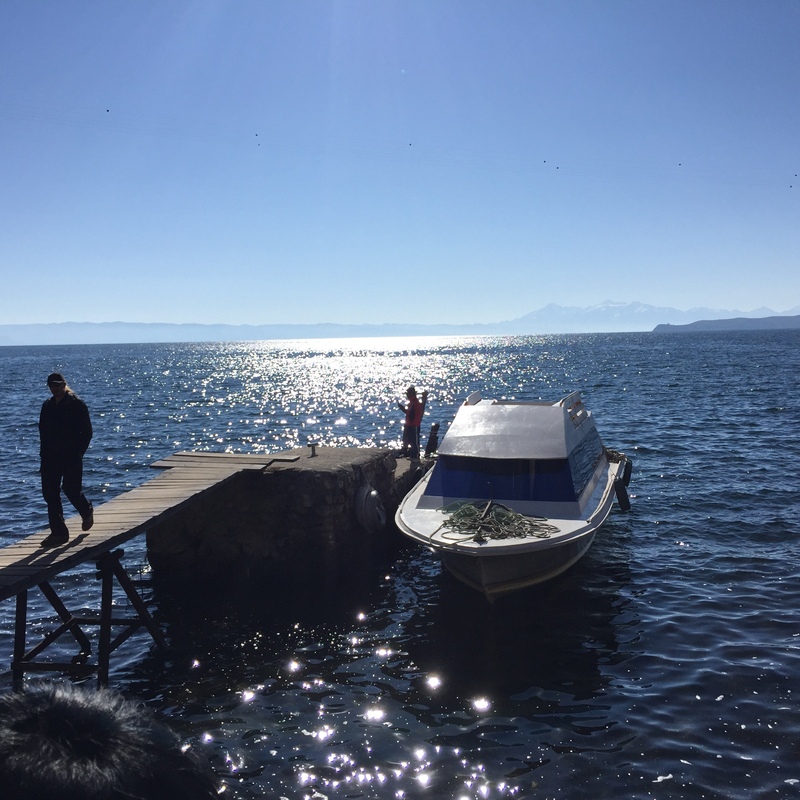 Our boat awaited us and took us back around to the inlet we had first docked and we walked back up to a small stone house, where we were served a local Indian buffet of corn, potatoes, trout, chicken, and vegetables. It was amazing, and with the backdrop of the picture earlier, will go down as probably the best lunch I have ever had. 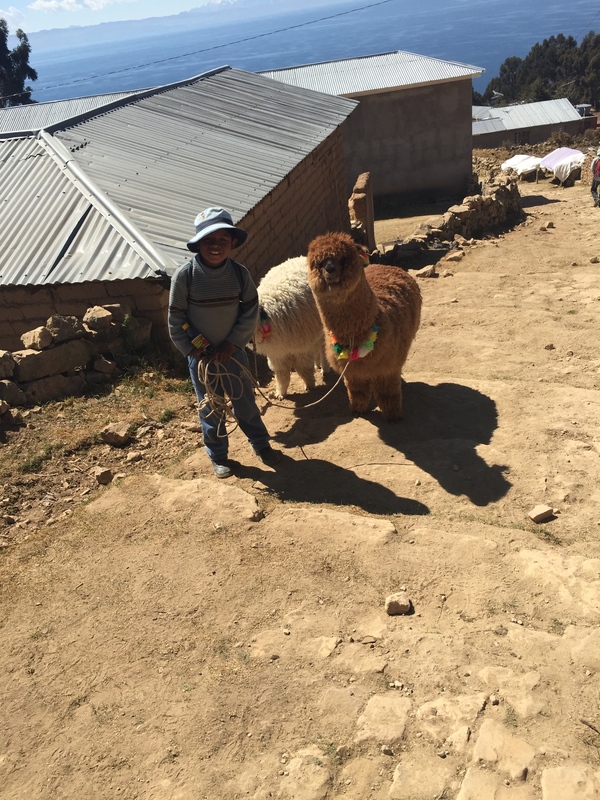 Local boy (who very enterprisingly charged me 2 Bolivianos for the privilege of taking his photograph) tasking his Alpaca for walkies. Walking down towards the main port. 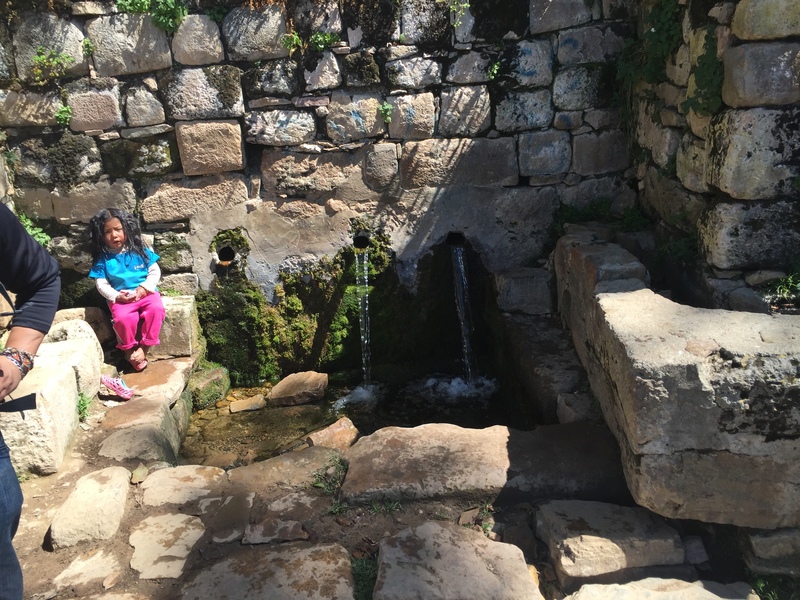 And the main source of water for the islanders, apparently the three outlets come from three different underground springs built by the Inca. 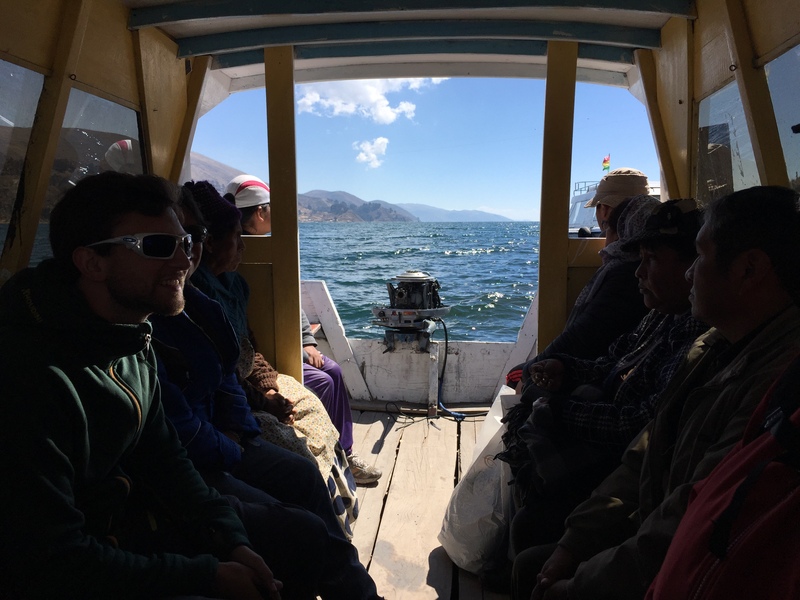 After lunch it was back onto our boat for the trip back to Copacabana, the unbroken sun glistening on the water and framing the Andes in the background the whole way. This is a magical and beautiful place in every sense. 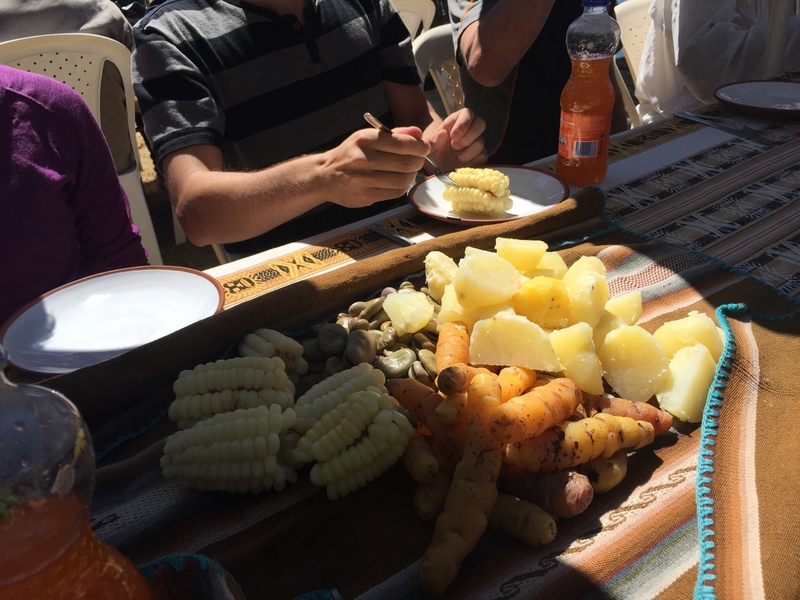 A selection of the local produce for lunch, including the largest corn kernels I have ever seen! and it is time to bid the island farewell…. …and a ride on top of the boat lets everyone enjoy the scenery even more. 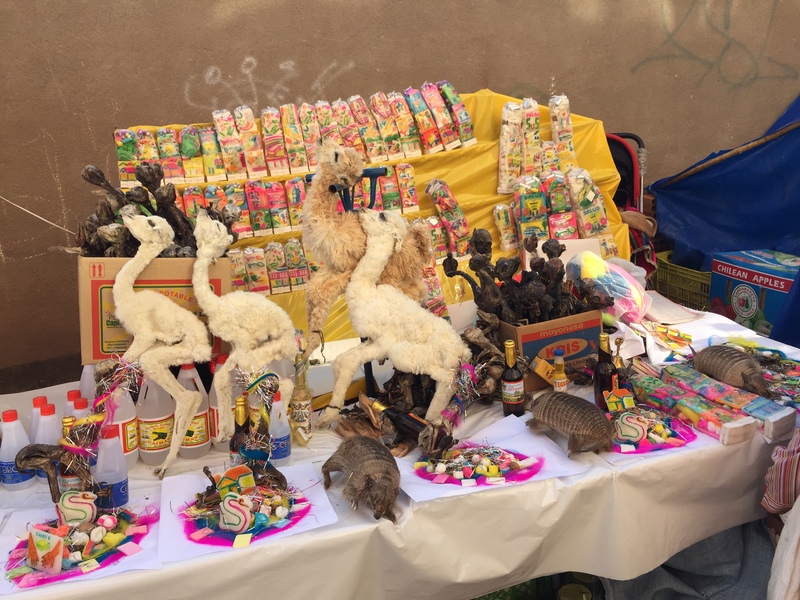 When we got back to Copacabana we went up to the and had a look round the markets of the town. Unfortunately there were so many people as to make it a frustrating rather than pleasurable experience, but the day couldn’t be spoilt because of the morning trip. …and trying to fight our way through the hordes…. The Basilica of Copacabana, a 16th Century shrine. After returning to the EcoLodge we ventured back into town for out last ‘proper’ meal of the trip, or at least the last one not in a tent at any rate. Despite a nice meal, the evening was significantly spoilt for one of the two Johns, who had his rucksack stolen in the restaurant from almost under his nose, by whom and how we will never know. He lost jackets, glasses, GPS amongst other things, so the rest of us are trying to cobble together stuff for him to borrow so he can continue his climb. It just shows you that you can never be too careful. So then it was back to our hotel, the last night in a bed for us (bar one) until the return home to the UK in over two weeks time. Our acclimatisation attempts are over, and if you weren’t ready now you were never going to be. I had taken paracetamol for headaches the last two days, but finally felt free of the need to do so, although a bout of ‘travellers tummy’ reminded me that in foreign climes with substandard sanitation, you were never far away from the wrong side of feeling well. 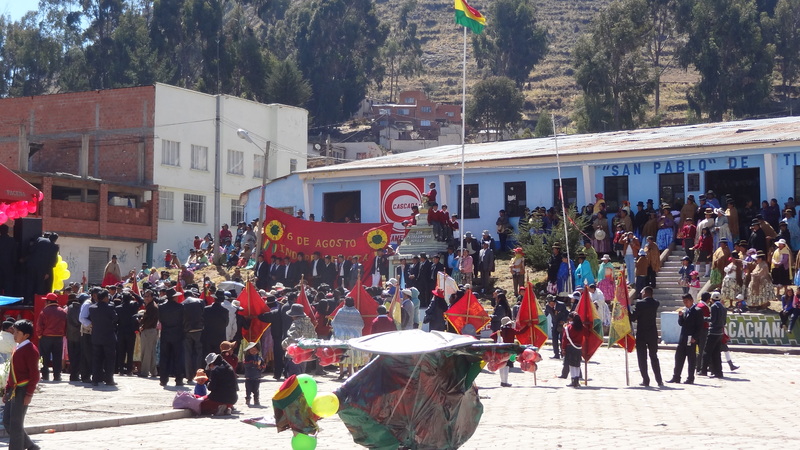 Bolivia had so far served up some real treats, and had far outweighed my expectations in terms of experience. 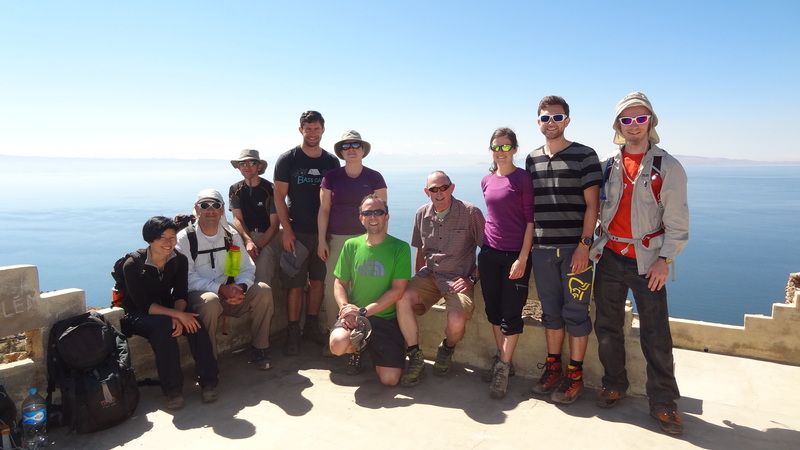 Tomorrow the ‘real’ adventure would begin – we would head off by bus to the Cordilla Réal and into the Andes. The mountains beckoned at last. 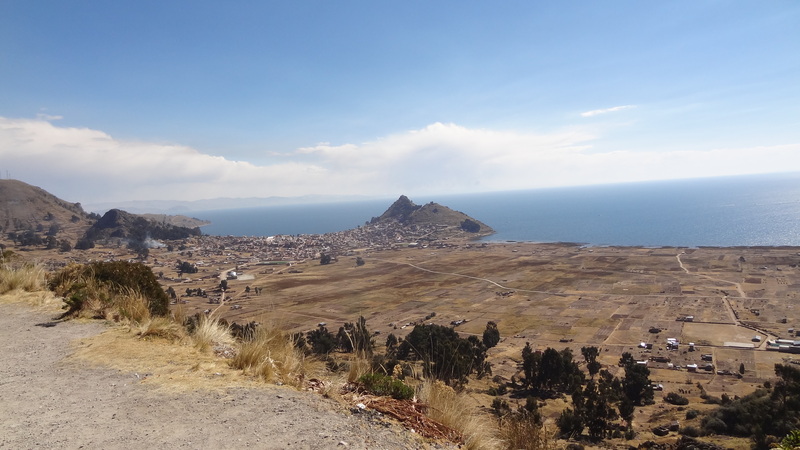 Day three would see us leave the city of La Paz and head for two days at Lake Titicaca, slightly (but only slightly, at about 3,800m, or 12,500ft) higher than we were now by means of further acclimatisation. 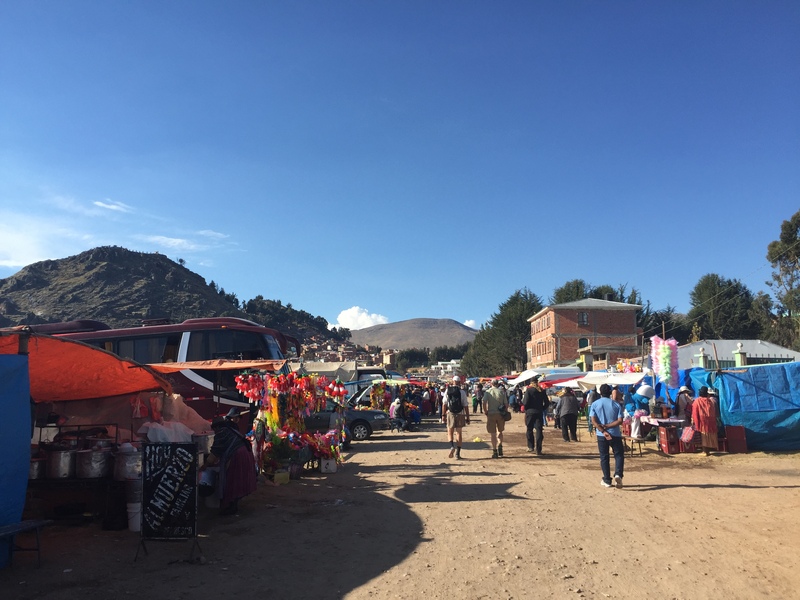 We set out with just a rucksack of things that we would need for the two days, and all of our mountain equipment went off separately in our duffels which we would get at base camp at Condoriri on day five. 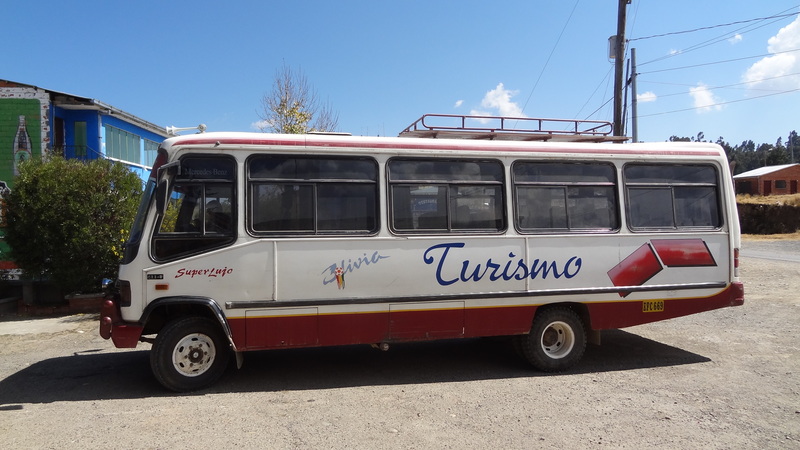 Our bus for Titicaca (and beyond, as they say) – a rickety old thing but it served us well. 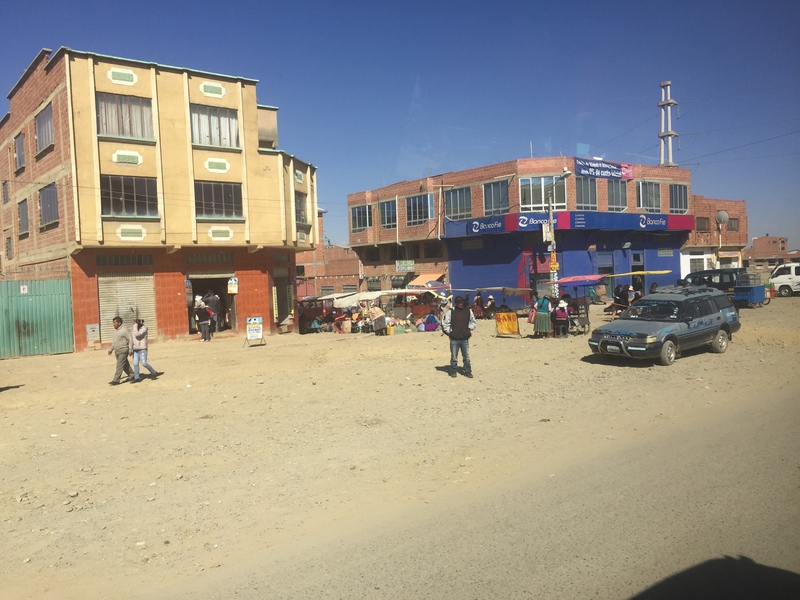 Leaving the city in a minibus which had certainly seen better days, we chugged our way up through the polluted north of the city and past El Alto, the new city by the airport. 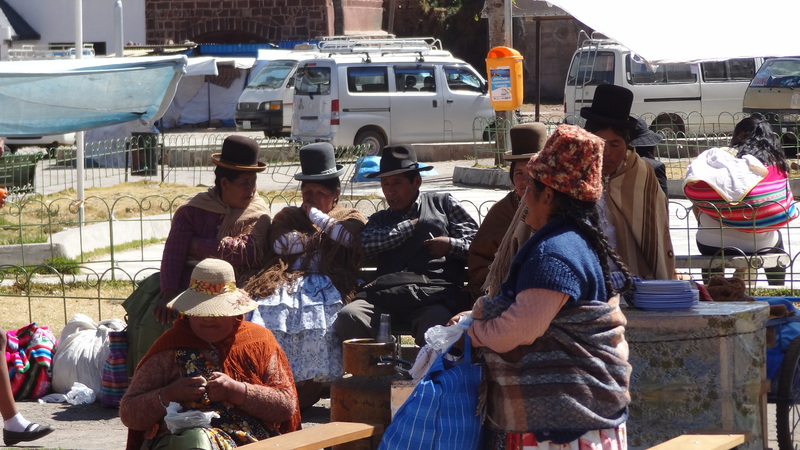 El Alto is certainly La Paz’s poorer relation. At a million people though, and still growing by 6% per year, it is the country’s second biggest city, and out of control in terms of waste, crime, infrastructure, and everything else. Pretty it most certainly is not. 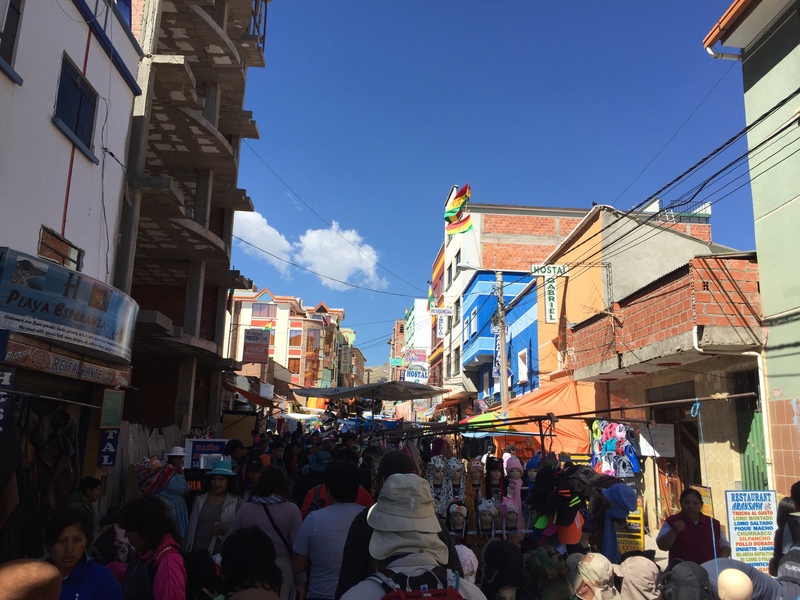 And more El Alto scenes – this is the main street. 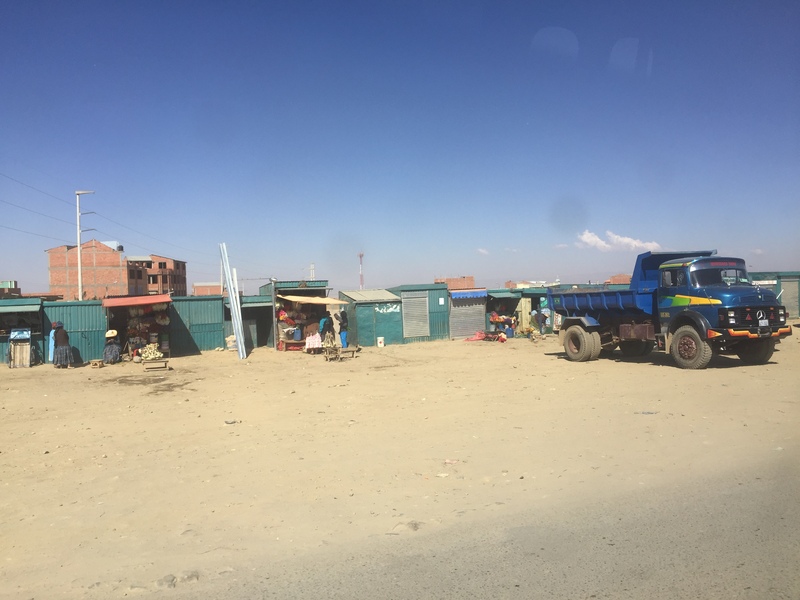 The back streets which we would go through were much more barren and scarier, I didn’t dare get my camera or phone out, even in the bus. 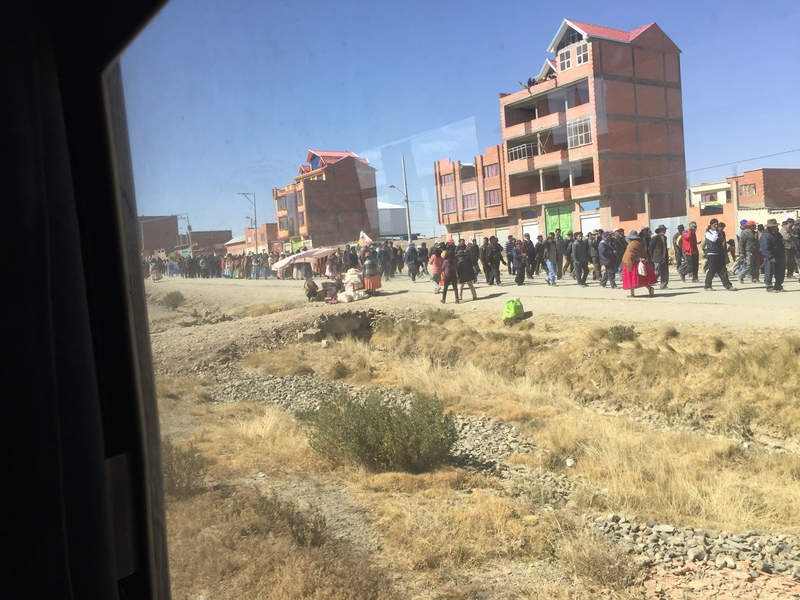 Travelling through the far side of El Alto it became clear that our bus was not going any further as there was a huge parade going down the centre of what appeared to be the only road through town. The parade was part of the Independence Day celebrations, which was in two days time. The start of the Independence Day parade which halted our progress. It may not look that big from here, but this parade must have been at least two miles long! The bus ended up following other traffic which was trying to do the same as us and circumnavigate the town. The only way to do so was through incredibly bumpy dirt tracks. This led to various dead ends, and also going through some very dodgy back streets where there were mannequins hung on the walls of houses with messages threatening death by burning and torture to those who contemplated burglary. I was glad the bus didn’t break down or get a puncture, as a bunch of tourists in mountain gear and glacier sunglasses would really have stuck out like a sore thumb. 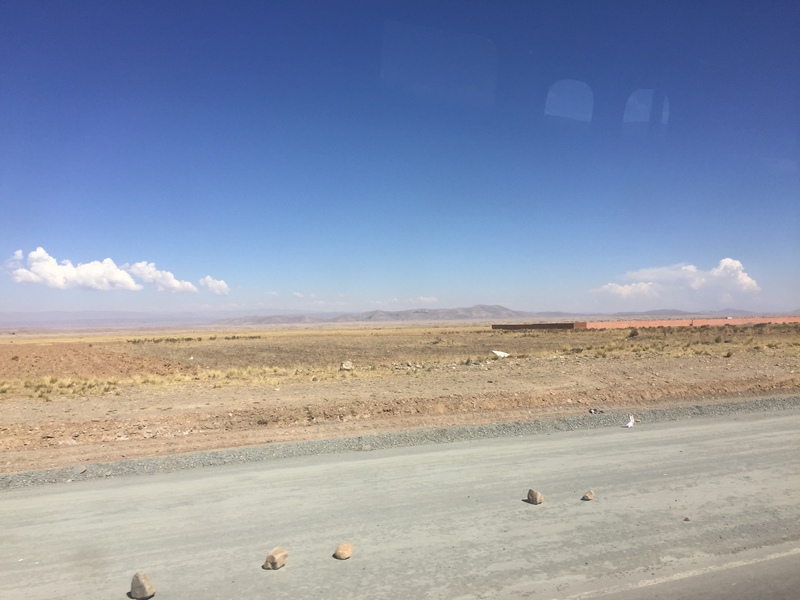 Having eventually cleared El Alto (it must have taken an hour) we were now on miles and miles of very dry plains, the Altiplano. The Altiplano is an agricultural area growing principally potatoes and quinoa, although how anything grows in such a desolate area at 13,000 feet is beyond me. 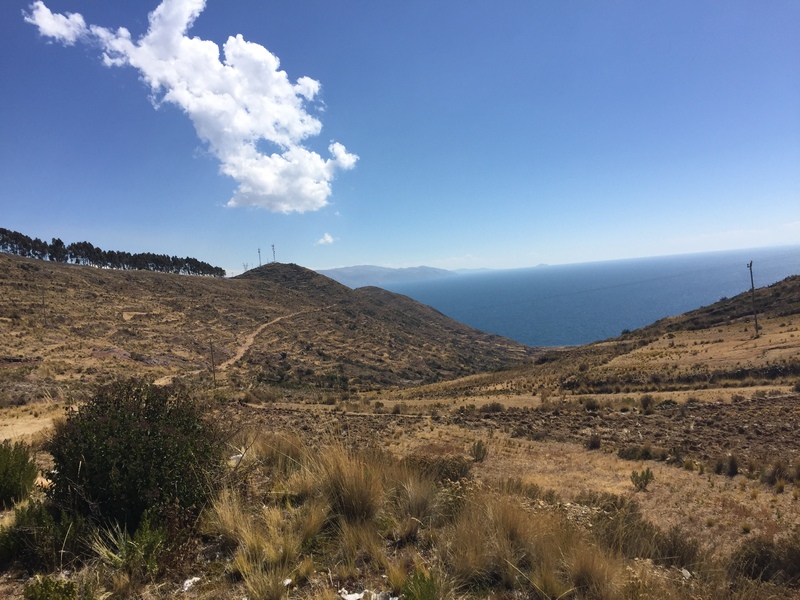 A section of the Altiplano, a bland featureless high altitude desert/scrubland. 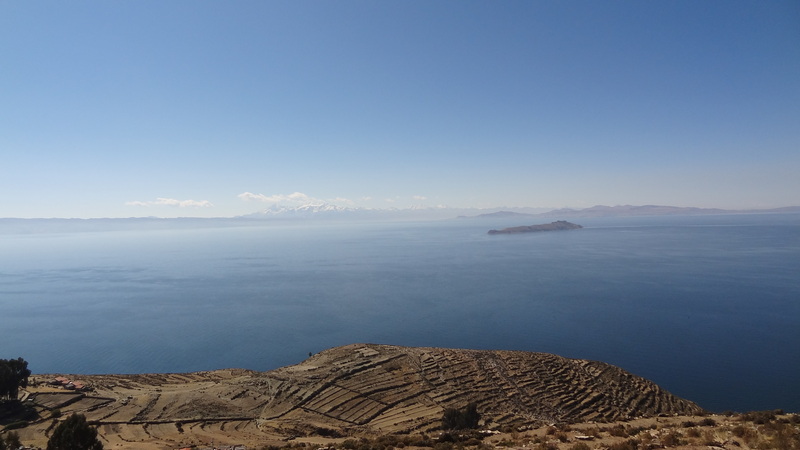 Eventually we got our first site of Lake Titicaca, and it looked magnificent, even though we could only see a very small portion of it. Having said that, a small portion is all you will ever see of it, as at 5,500 square miles, the word colossal doesn’t even come close to describing it. 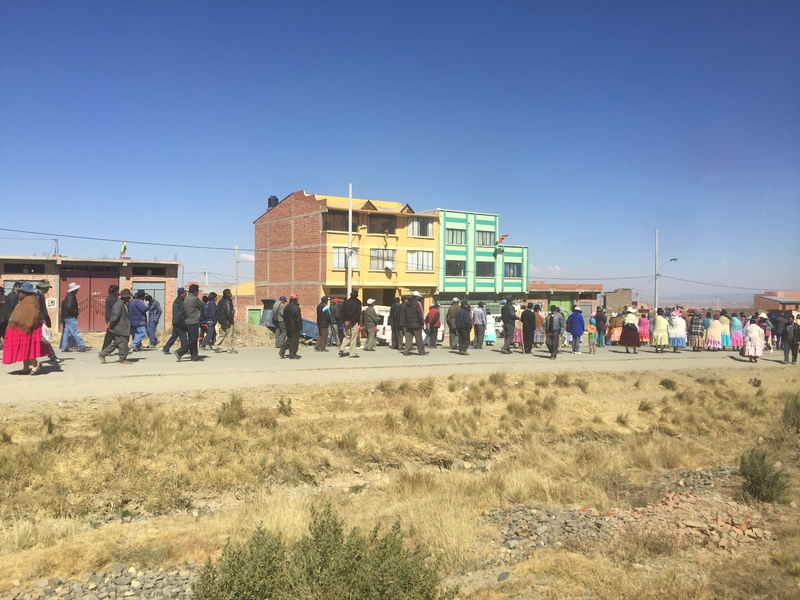 It was a pleasure to see after the scary trip through El Alto. 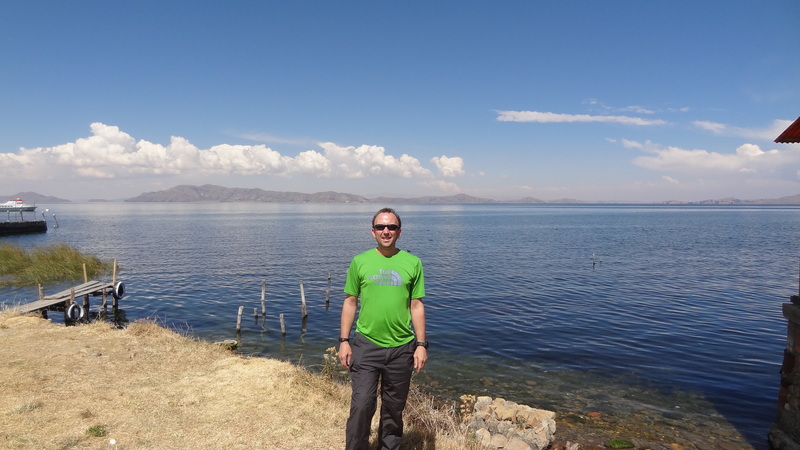 First sighting of the quite magnificent Lake Titicaca. The lake begins to open up in terms of scale. We then after about another hour got down to the edge of the lake and to get to our destination we needed to cross part of it. To do so the bus had to go on a barge without us as passengers, and we had get get onto a mini covered speedboat, which was so low in the water that the lake was almost at eye level as you sat down. Thankfully the crossing was only 800m or so, and passed otherwise without incident, although it was certainly an exciting way to break up the journey. Our bus followed in an only slightly larger barge. Meanwhile the 6th of August (still two days away) celebrations continued on the shoreline. 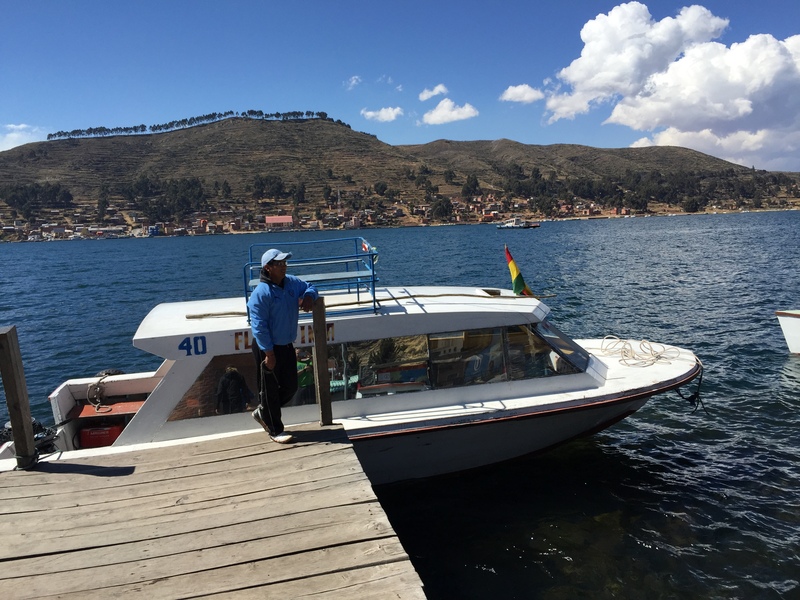 The journey to Copacabana, our resort destination on the edge of the lake, took four and a half hours in total. Copacabana it seems was the ‘original’ one, and is steeped in history. 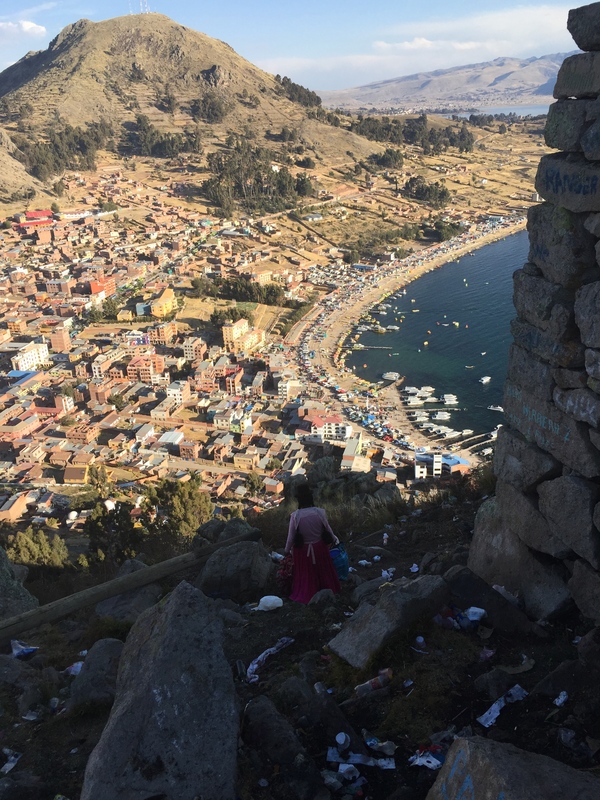 It is also a place of pilgrimage for many thousands of Peruvians, all of whom were parked along the shore of the lake partying like it was the end of the world. And this was 3pm. First view of the resort of Copacabana, our home for the next two days. The Ecolodge, a bit of an oasis in the madness of Copacabana, thankfully it was right at the far end of the town itself. 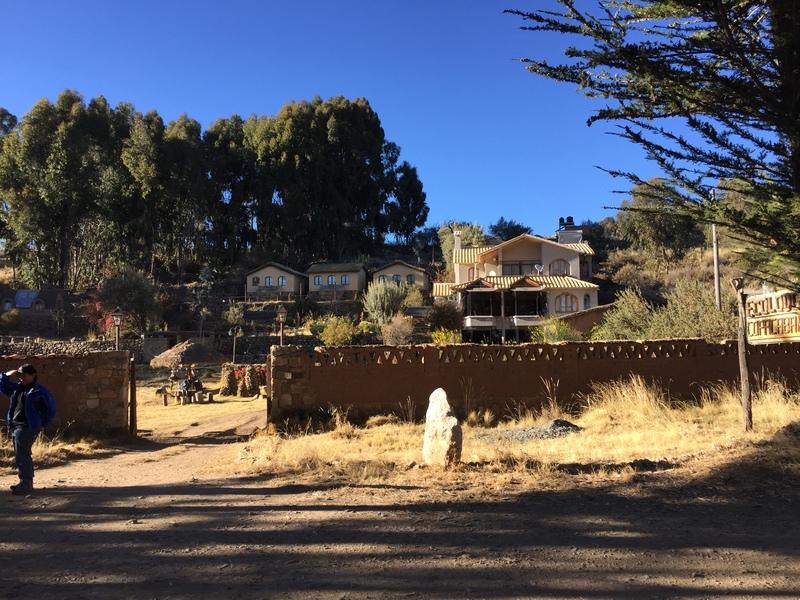 Having dropped our stuff off at the EcoLodge, our home for the next two nights, we went for a walk up to the top of the hill (Cerro Calvario) which overlooks the town. This proved fairly tricky for two reasons. 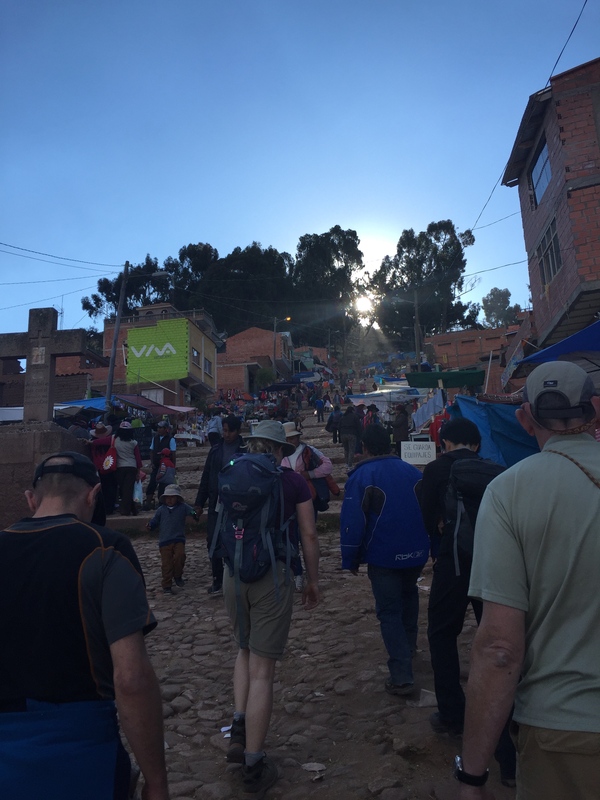 Firstly it would be the first time we had walked up to 4,000m, and the thin air was hard work. 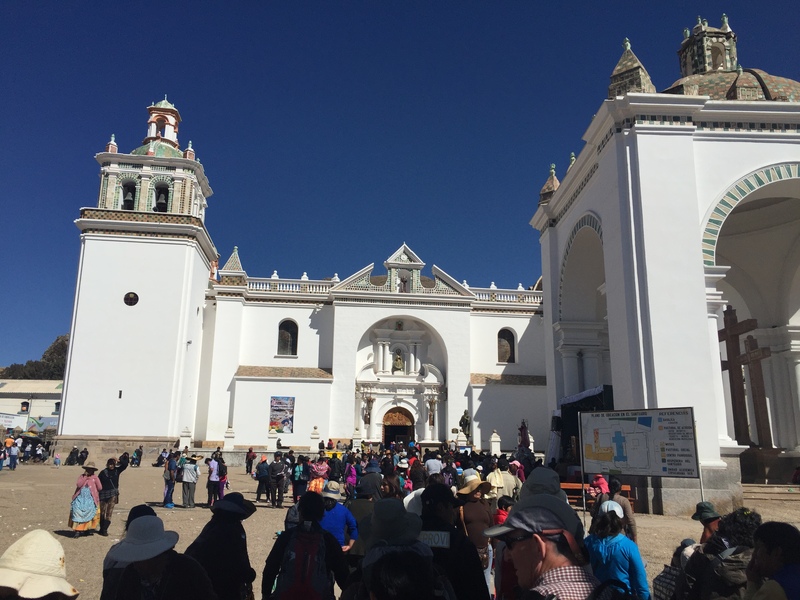 Secondly we had to push our way though all manner of Peruvian stalls, hawkers, buskers, religious fanatics queuing to place candles, and just general drunken folk. It was madness. There were firecrackers going off everywhere, and the air was ripe with the smell of manner of substances, some of which might have got me up the hill quicker, but thankfully only the smell came close to me! 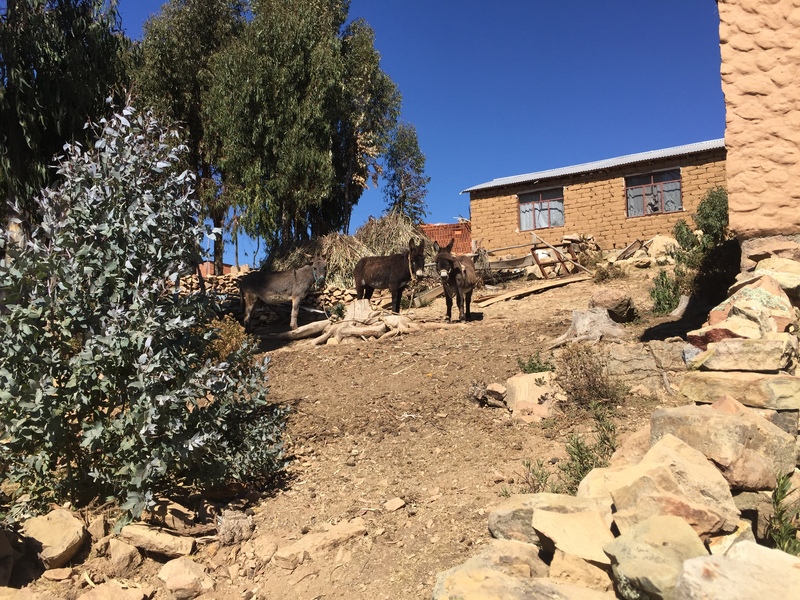 Walking back towards the hill in town….. The Peruvians like to dress up their cars and vans for the part too! More llama foetuses and armadillos on display though I’m afraid. Eventually we would begin to wind our way up the hill, even though the people were everywhere. Reaching the top of the hill, which is basically a religious shrine, we admired the great view back down over Copacabana beach. View back down from the top of Calvario Hill. 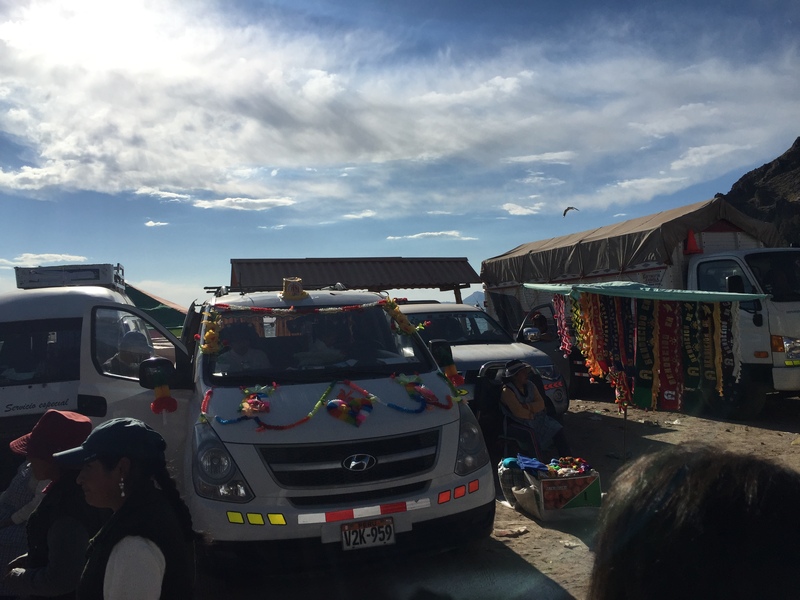 As you may be able to see, there are probably 2,000 Peruvian cars and busses parked along the beach! 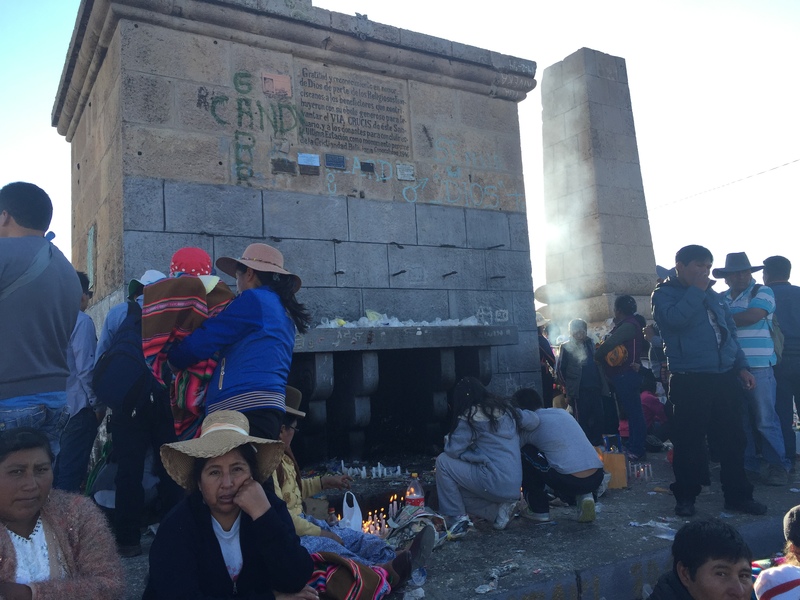 We also got to share the top with approximately 10,000 mainly drunken Peruvians, although many were also there (presumably slightly less inebriated) to just light candles and get their blessing. The blessing itself does however involve much beer throwing and drinking, one of the strangest rituals I have ever witnessed. They also douse their cars in confetti, party hats, garlands, and more beer. Quite a sight, is all I can say, but again it is amazing to see other people’s traditions and rituals, one of the wonders of travel that I am so grateful for. 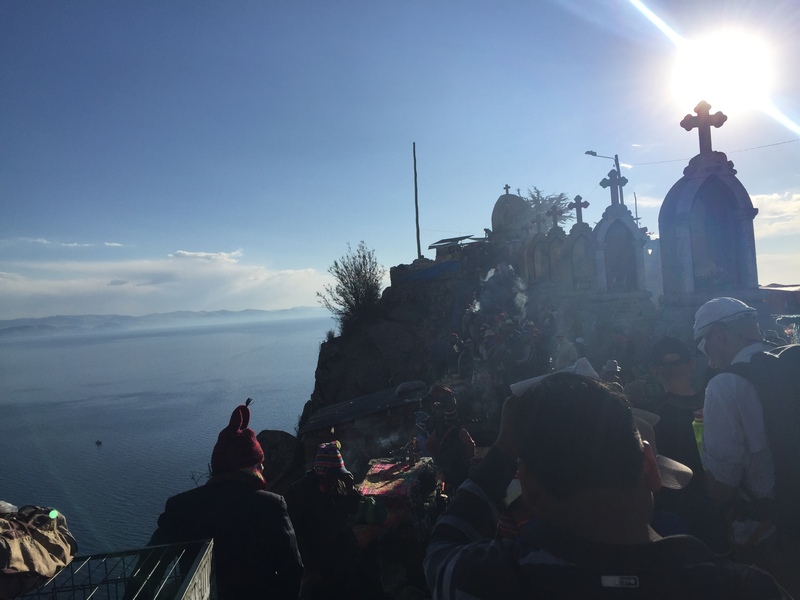 And this is what they come for…..
…in their masses, to worship at the 13 crosses on the top of the hill. Part of the view out over the lake as the sun starts to go down. It was transfixing, and intoxicating, and not just because of all the smells wafting around on the top of the hill! We got down the hill just before sunset and ate dinner in a thankfully fairly quiet beachfront restaurant before heading back in total darkness to the EcoLodge, followed by a multitude of stray dogs, but thankfully by no Peruvians, who by now were just wandering around aimlessly or playing ridiculously loud pan pipe music and dancing like idiots. Good for them! It had been a great day, as unexpected as it was interesting. 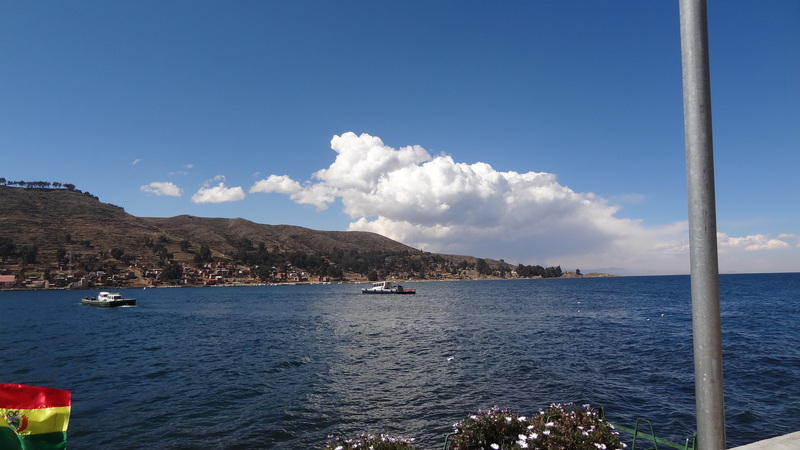 Lake Titicaca herself, the reason we were here in the first place, would reveal herself in all her majestic glory in tomorrow’s boat trip to the largest island on the lake, Isla Del Sol, or The Island of The Sun. But I was loving it already. An early night beforehand however was as welcome as it was much needed.